For boring large diameter holes in masonry, this powerful hand drill and diamond core bit will bore holes up to 152mm in diameter. 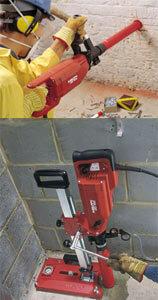 To convert to a precise wet drilling system, the hirepack includes quick fitting rig and water bottle. The vacuum pump enables temporary fixing without damage to most surfaces.